It has been a busy week for Independent Reserve. We became the first crypto company to make the Australian Financial Review’s Fast Starters 2018 List. We also became the first and only exchange to feed XBT/AUD prices to Bloomberg and one of only six exchanges globally to feed XBT/USD pricing. It’s something that has been in the works for quite some time and we are pleased to be contributing to what many reference their crypto pricing to. Bitcoin Cash has rallied last week (up ~27%) in anticipation of next week’s fork. The hard fork is scheduled for the 15th November. More on this and how it will effect trading next week here. Bitfinex and Tether announce a new banking relationship with Deltec Bank and Trust. 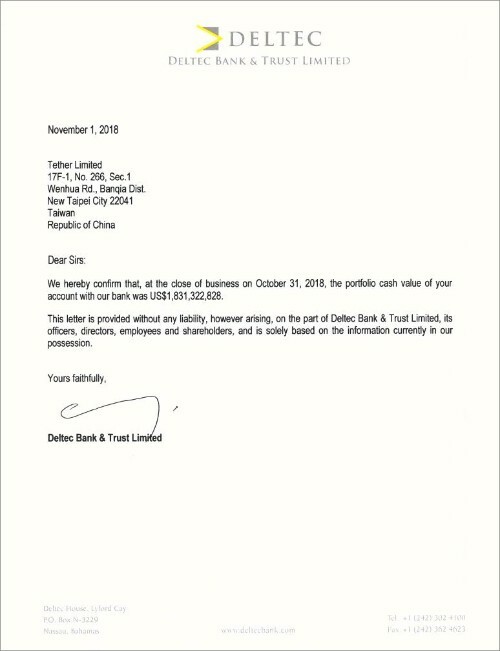 A photograph is doing the rounds that appears to be a letter addressed to Tether from the Bahamas based bank. It states Tether’s account balance of just over USD$1.8billion. This is more than the USDT market cap (~1.765billion). It would be great if this put an end to the Tether scepticism, but alas there are plenty of comments out there questioning the document’s authenticity. Bakkt has announced a launch date for their physically backed Bitcoin futures contract. Subject to any last minute regulatory objections the product is scheduled to go live on the 12th of December. Many are looking at this launch closely. It will be interesting to see if the launch has any impact on Bitcoin price action. In February this year Australian regulators actively shut down local crypto betting shops like NedsCrypto. One international firm has taken advantage and had a deep offering of Melbourne Cup markets. Regulators can’t realistically stop Aussie punters from accessing offshore betting sites like 1XBit.com. That said, I’d imagine tax time is going to be a little more interesting for anyone that got up on Cup day with one of these sites. At the time of writing XRP has had a decent run over the past couple of days. One driver for the rally might be some rumours that as part of an upcoming upgrade to the SWIFT network, Ripple products could be available to around 4,000 banks. A spokesperson for SWIFT has allegedly come out denying these rumours, however this hasn’t seemed to stop the XRP rally. More on this next week.